I love Thai food, but I used to be intimidated by Thai cooking. The ingredients were foreign and I had never cooked in a wok before. Finally I took a Thai cooking class and realized that the cooking was actually pretty easy and the flavors are amazing. 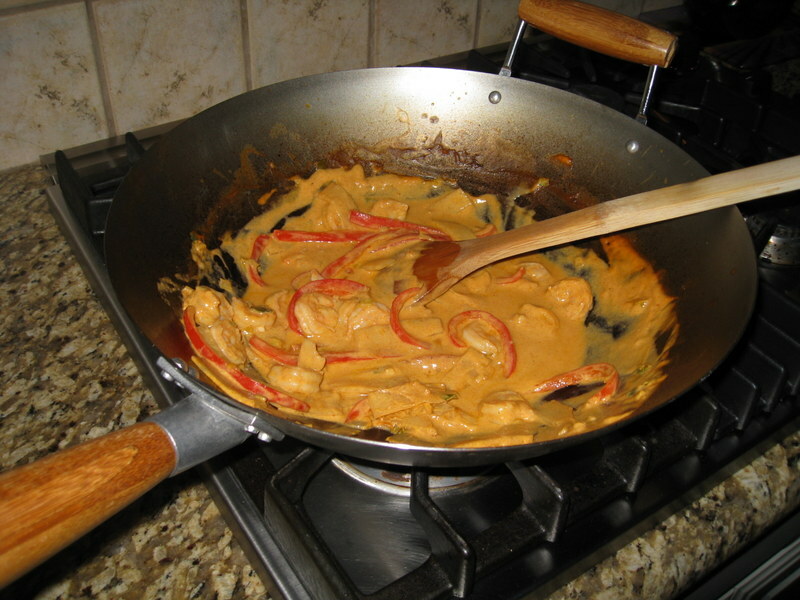 Every time I make red curry I am reminded of how quickly it can be prepared and how outstanding it tastes. I rely on red curry paste (available in the Asian section of the grocery store) to provide the curry base. Cooking in a wok isn’t hard, but it happens fast. You need to chop up and assemble all of your ingredients ahead of time. 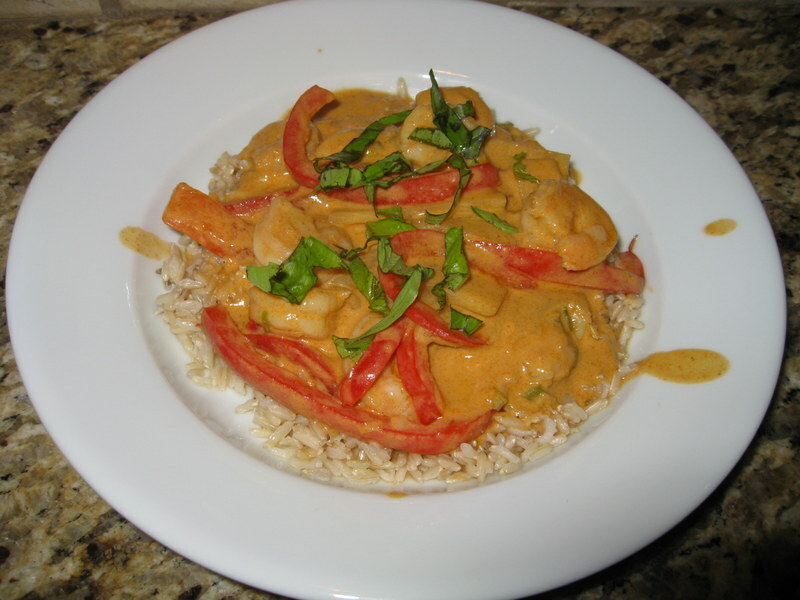 Here is my recipe for Thai red curry. You can make this with beef or chicken, but I like it with shrimp. After assembling my ingredients, I heated the oil in the wok over high heat. (You can use a large skillet if you don’t have a wok) An Asian cook taught me the trick of how to tell when the cooking oil is hot enough by doing a chopstick (or wooden spoon) test: simply stick the end of the chopstick into the pan all the way to the bottom of the wok. If small bubbles form at the base of the chopstick, it is hot enough. 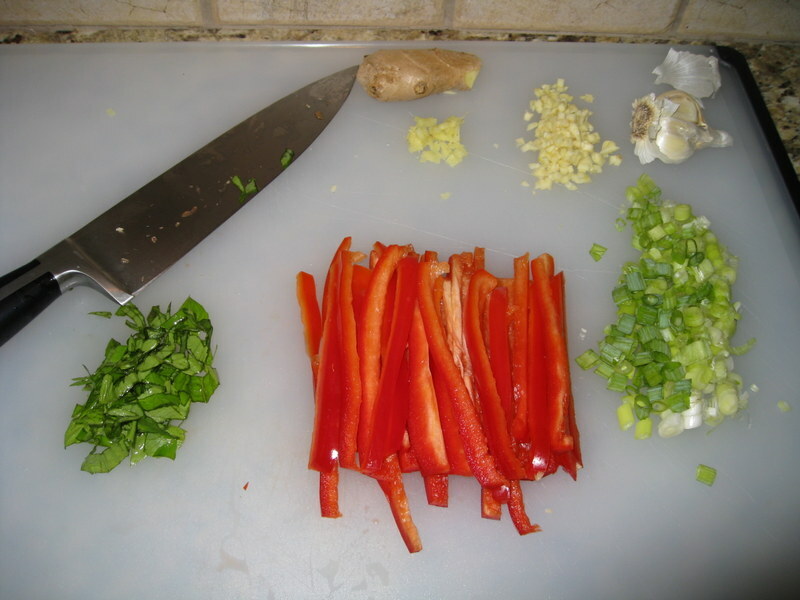 I then added the green onions, garlic, ginger, red bell pepper and chilies (if using). I stir fried for several minutes until the bell pepper started softening slightly. I added the red curry paste and cooked for one minute. I then added the fish sauce and brown sugar to the pan. If you’ve never used fish sauce before, the smell that comes out when you add the fish sauce will make you think you just ruined it. Trust me, you haven’t. The stuff smells awful, but it makes Thai food taste great! I cooked the mixture for another 30-60 seconds and then added the bamboo shoots and coconut milk. I let it cook for a few minutes. Then I added the shrimp and let it cook just until the shrimp was pink. That’s it – then it’s done! I served this over brown rice (because it’s healthier than white, but you can use white or jasmine if you prefer). It was amazing! My husband loves this dish. He thinks we need to cook it for company sometime. It is hard to believe that I can make this at home since it tastes just like the dish at my favorite Thai place. This recipe was adapted from one used at the Central Market cooking school.